If you could travel in a Time Machine would you go back to the past or into the future? The future. Just like with books, I want to find out how this monkey-with-thumbs experiment turns out in the end. I might not have to go that far into the future to find out, come to think of it. If you could invite any 5 people to dinner who would you choose? Director Kevin Smith for the stories, Mark Twain and Kurt Vonnegut (to figure out for sure if the latter is the reincarnation of the former), Joe Rogan for the conversation and Richard Branson for the ransom. If you were stranded on a desert island what 3 things would you want with you? Wifi, computer and a five-star hotel with liberal policies on that little fridge with the overpriced nuts. What is one book everyone should read? The Color of Light by William Goldman. He’s famous as a screenwriter, but he’s the most underrated American novelist still clinging to life today. If you were a superhero what would your name be? Everyone would call me “sir” like they do now, but maybe they’d say it less ironically. If you could have any superpower what would you choose? Immortality would do fine. Failing that, I wish I were a better typist. What is your favorite flavor of ice cream? Chocolate fudge. Just about anything else is an abomination. If you could meet one person who has died who would you choose? A good friend of mine who was a pastor who died horribly. I want to know if his belief panned out. I miss our chats. What is your favorite thing to eat for breakfast? Coffee. Then more coffee. Night owl, or early bird? Night owl, usually until 3 a.m. nightly. One food you would never eat? Caviar. Overrated times a million. It’s the food that proves the rich are as dumb as the rest of us. Pet Peeves? People who are unkind and people who underestimate me. 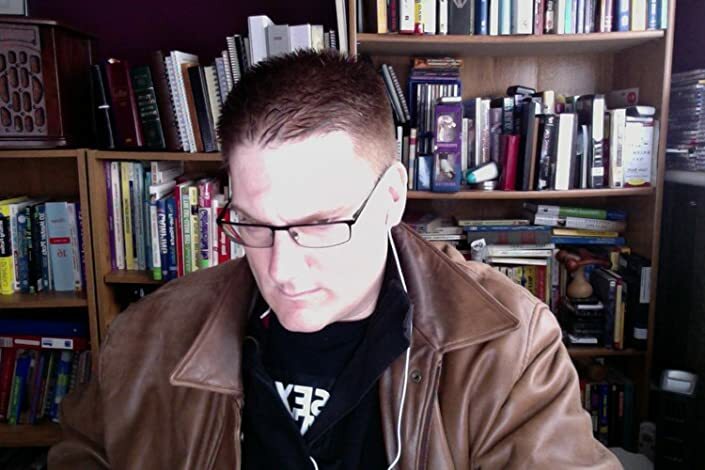 I write Bad versus Evil, so I kill those unkind people repeatedly…in fiction. Skittles or M&Ms? M&Ms. I have a high level in my blood. Please tell us in one sentence only, why we should read your book. 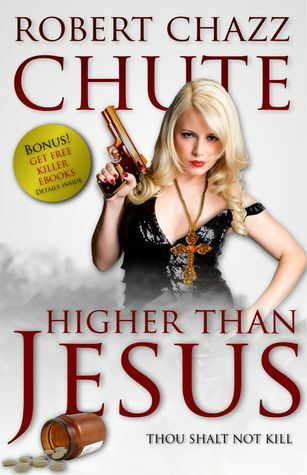 Higher Than Jesus is hardboiled fun that’s full of twists, surprising depth and lots of jokes. Any other books in the works? Goals for future projects? Tons of ideas, not near enough time. I’m about to release the ultimate collection of my short fiction and suspense, Murders Among Dead Trees. After that? The next book in the Hit Man Series and a dystopian coming-of-age thriller. Lots coming down the pipe. What inspired you to want to become a writer? I guess I got infected at birth and the disease has never left me. I love to read books so I wanted to write books. They taste great, too. Tell us your most rewarding experience since being published. Getting those five-star reviews makes my day, but the best part is truly having the opportunity to lock myself away and write. The writing releases the dopamine and that tickles my brain. Writing is a drug. If you could jump into a book, and live in that world.. which would it be? Wind in the Willows seems pretty sweet and safe. Maybe Winnie the Pooh if Rabbit wasn’t too annoying. All the other books that interest me are not safe to actually inhabit. What is your dream cast for your book? A couple friends of mine were onstage with Enrique Eglesias last summer in Toronto. That convinced me he’d make a great Jesus Diaz. Ving Rhames for Chill, the big, gay bodyguard. Charlize Theron comes to mind to play Willow Clemont. What was your favorite book when you were a child/teen?1984. Much of it came true, too. Is there a song you could list as the theme song for your book or any of your characters? Salsa music and definitely Everlast. I’m especially in love with Everlast’s “I Get By.” That could be my hit man’s theme song. What’s one piece of advice you would give aspiring authors? Keep writing and don’t be discouraged by dream killers. They’re everywhere and they’ll sap your energy and drag you down if you listen to them. If you could choose only one time period and place to live, when and where would you live and why? I think the next sixty years are going to be very interesting if we survive them. I envy my ten-year-old son’s future. There will be serious problems, but I think if we play it right and we’re lucky, between the tech and the medical advances, his generation could be much happier than I intend to be when I’m elderly. As for where to live, I’m working on plans for a moonbase in case all my uncharacteristic optimism doesn’t pan out. If you could live anywhere in the world where would it be? I love Victoria, BC, though Ireland suits my mood and Madrid suits my aspirations. A fort in Switzerland might be nice, too, as long as I had an Alfred to polish the Batmobile. I slipped into the ditch on this question, but I’m a professional dreamer. What is your favorite Quote? Question Authority before Authority questions you. When you were little, what did you want to be when you “grew up“? A writer. And Batman. I’m doing the first part and working on the second…I’ve said too much.